Coolies ? Drums ? Bells ? Are we talking Chinese music or lamp shades ? First we should lay a little ground work for this discussion. 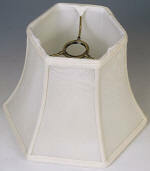 A lamp shade has 3 basic measurements: top width, bottom width and side or slope length. There are other measurements on complex frames which is another subject. 1) Empire - Has a straight sloped side. The shade slope is not exaggerated but rather at a traditional angle. 2) Bell - Sides are curved not straight. 3) Drum - Drum shade tall shape > Drum shade shallow short shape > A round barrel cylinder shape with straight side where the top and bottom diameter are near each other crating a near cylindrical or drum type of shape. 4) Coolie - A round shape with straight or curved sloped side. The shade slope is exaggerated due the top diameter being much smaller than the bottom diameter thus resembling a Chinese coolie hat. 5) Square - You know this one. 6) Rectangular - Shade is oblong with right angle, cut or inverted corners. 10) Cut Corner - The corners are cut straight across instead of a right angle. 11) Inverted Cut Corner - The corners are cut inward in a curve instead of a right angle. 12) Inverted Out round Corner - The corners are rounded outward in a curve instead of a right angle. 14) V Notch - The top or bottom edge has a "V" shaped design instead of being straight. 15) Gallery - The bottom edge has a wide gallery section which may have a different decorative treatment. 16) Fancy Square - A square top bell shape with square bottom where each bottom side has a single out scallop. 17) Bouillotte - A short drum (or bell drum), named after the French card game where this lamp and shade had its origin. 18) FLOOR lamp shade = short drum(or bell drum) also called "Junior" made especially to fit a 6 way 3 arm reflector floor lamp that became popular c 1930. 19) Uno - The shade "FITTER" is large enough to slip over or screw over the socket, commonly found on bridge arm floor lamps and cheap Chinese imports. 21) Wicker - Made of natural materials (also bamboo, rattan, sea grass). 22) Scallop lamp shades - Undulating curved top or bottom creating a wavy appearance. It may be obvious that this could go on limited only by our imagination and the makers skill. Then there are custom shades in great variety and complexity. Some say the shade makes the lamp and there is some truth in that. Just do not begin with an ugly lamp and expect your shade to redeem it ! Good luck on selecting your next lamp shade.